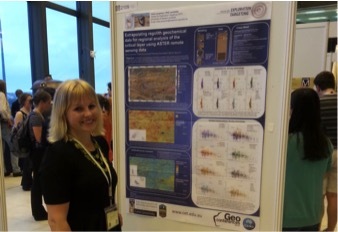 I am grateful to the Geoconferences for the generous award of JH Lord Travel Grant, which helped to cover majority of expenses for the Goldschmidt2015 (16-21 August) in Prague, Czech Republic. Goldschmidt is one of the largest geochemistry conferences and it has several multidisciplinary themes on various research topics gone over the six days of program. The Goldschmidt conference provided me an excellent opportunity to showcase my data, the processing and interpretations made so far, and to get feedback early in my PhD project. It was also a great opportunity to learn from talks and poster presentations about the recent advances in research in weathering processes and in the use of geochemistry in mineral deposit exploration. The title of my poster presentation was “Extrapolating regolith geochemical data for regional analysis of the critical layer using ASTER remote sensing data” and it was categorized in the ‘Theme 5: Weathering and Surface Processes’. In my poster presentation I showed the audience the most recent findings in my work with the surface reflectance spectra dataset, most of it collected just two months before conference. I demonstrated the use of reflectance spectra from regolith samples, processed in laboratory and surface profile measurements conducted on site, in the identification of Al-clays, and the correlation found between remote sensing (ASTER and radiometric potassium) and surface data. During the conference I met scientists in field of surface processes and mineral systems and discussed over the possible paths to take in the future processing and interpretation of my data. The responses to my ideas were positive, which gave me much appreciated reassurance to go ahead full steam with them. This was an excellent experience for me, made possible by Geoconferences JH Lord Travel Grant.